Two nights ago I mentioned my new job, ID’d the “four-hundred pound gorilla,” and said, “…let’s see if I can hit 50K words despite that, not use it as an excuse to fall short.” Then yesterday happened. 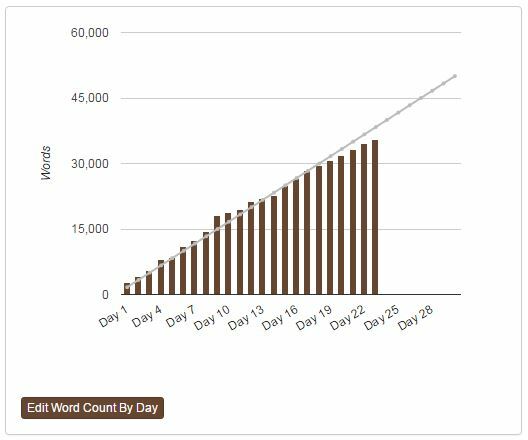 That grey line is the 1,667 words per day you need to average to hit the 50,000 word mark by December 1st. It’s obvious that it’s pulling away from me, and the last five days of the month aren’t going to help with Thanksgiving, family visiting, Christmas lights, Saturday a long day at the CAF hangar, and starting the new job on Monday. It’s also good to remember that this isn’t worth stroking out over. Or maybe she just needs a fifth of Jack Daniels. You know how muses are. “Where were the ships that were hunting him? With a hard flip of his tail, Hōkū was gone, his companions following him, much more slowly than they had come. There was none of the normal playfulness in their actions and they appeared weak and listless after the ordeal. Still, the companion guard dolphins kept Hōkū at the center of their group, safe from any possible enemies or dangers. Sherman quickly started rifling through various data sets, pulling the information he would need to find and help Kolohe. He had to quickly figure out where he was now, who was hunting him, and whether or not Kolohe was still free of them. He was not at all sure what he would do to help when he got answers, but there would be time for that later. Starting with approximately where he thought Kolohe’s people had been, triangulating that with where HDC Buoy 319 was, factoring in how fast Hōkū and his group could swim and how long they had been on their journey, he had an idea of where Kolohe would have started. But why would he have swum directly at the ships and bots who were following him? Pulling data from satellite tracking and ship movements, he began to look for anything that might be Kolohe’s pursuers. There was nothing anywhere near where Kolohe had been, but that only meant that they were travelling without any transponders or other tracking assistance. That was almost unheard of, except for military vessels and those actively looking to avoid being seen, mainly smugglers and the few fools who thought they could still make a living by being pirates. It was a bit more risky than he usually was comfortable with, but Sherman accessed government satellite data which was used to visually track those running without transponders. The military had their own system for tracking enemy ships, but the Coast Guard, Navy, CIA, and FBI had systems for tracking those involved in illegal activities. Those records for the past ten days showed several targets being investigated by the authorities in those areas. All of them were speeding in straight lines, trying wherever possible to stay under thick cloud cover, their engines and exhausts baffled and stealthy to try to avoid being spotted by infrared systems. I do believe in Paul’s muse. I also believe you’ve just hit two of the most stressful life events around. So unless writing takes you into your ‘happy place’, just go with the flow and forget the deadline. Funny things, self-imposed deadlines. Once I realise mine are not crucial to everyone’s happiness, even mine, and that I can change them, I feel much better. 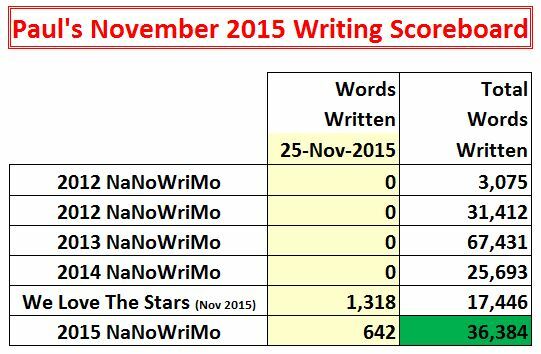 How about restarting on 25th December and finishing the NaNoWriYe instead? PS. I’ll also share some wise words given to us when our parents died: look after your mental health, look after your physical health, and look after the paperwork. ‘You’ may be plural in this case. Good advice, thanks, working on it.